How can I improve my low Valid Tracking Rates? What is Valid Tracking Rate? 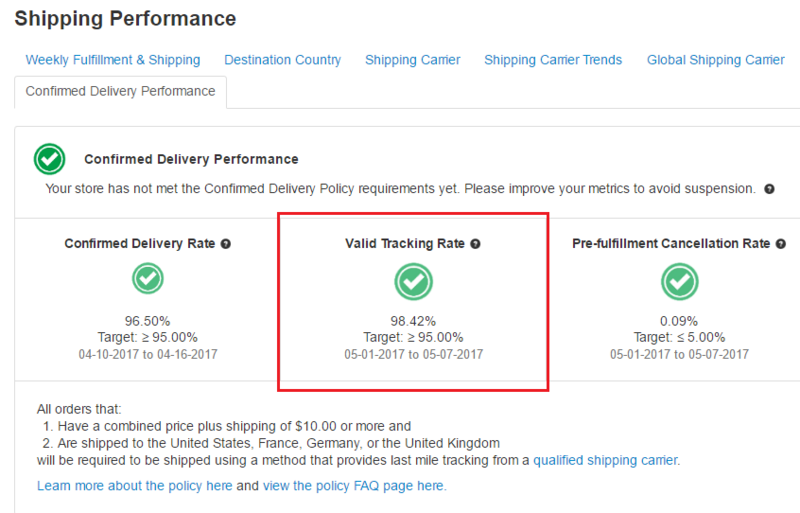 Valid Tracking Rate is defined as the percentage of orders confirmed shipped by the carrier. It is important for customers to be able to track their orders and have an accurate estimated time arrival. This will improve shipping performance and thus overall customer satisfaction rates. Click here to learn more about why you should provide tracking information for your orders. It is important to maintain your overall Valid Tracking Rate above 95%. 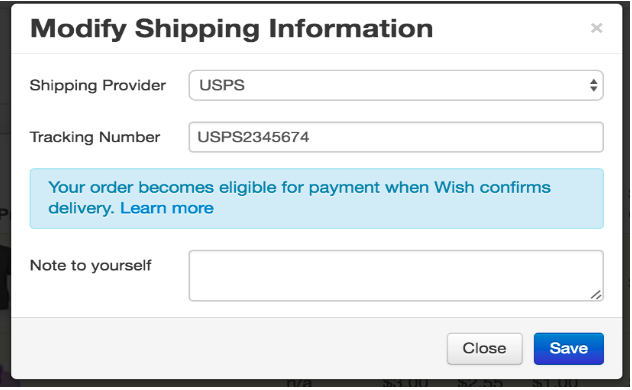 An order is considered fulfilled with valid tracking number only when the tracking number can be tracked and confirmed shipped on Wish's system. It is essential to fulfilling your orders with Wish's accepted shipping providers. 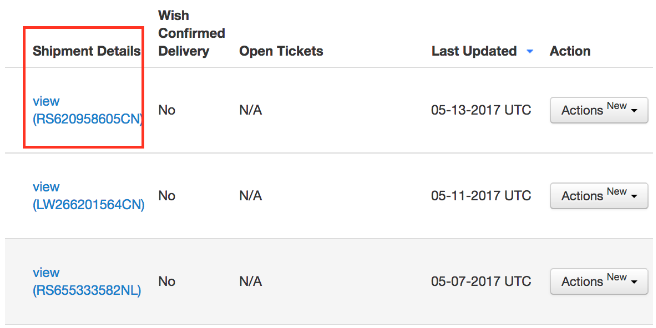 For orders that require delivery confirmation on Wish, fulfill with Confirmed Delivery Carriers. Ensure the tracking number is accurate. Ensure the shipping provider is accurate. Visit the shipping provider’s official website to ensure all tracking data is accurate. Merchant A receives 100 orders to be shipped to Germany. The merchant ships all the 100 orders within two days to Germany. Three days after shipping, the merchant receives the first carrier scan for all 100 orders. Merchant B receives 500 orders to be shipped to the United States. The merchant ships all the orders within two days to the United States. 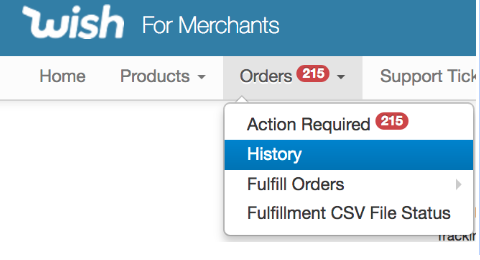 Three days after shipping, the merchant receives the first carrier scan for 300 orders. Thus, only 300 orders out of 500 orders were confirmed shipped by the carrier within 5 days from the orders being placed. The merchant’s Valid Tracking Rate is 60%. The merchant is not meeting the requirements and may be at a risk of suspension from Wish. Merchant C receives 1000 orders to be shipped to France. The merchant ships all the orders within two days to France. Three days after shipping, the merchant receives the first carrier scan for 980 orders. 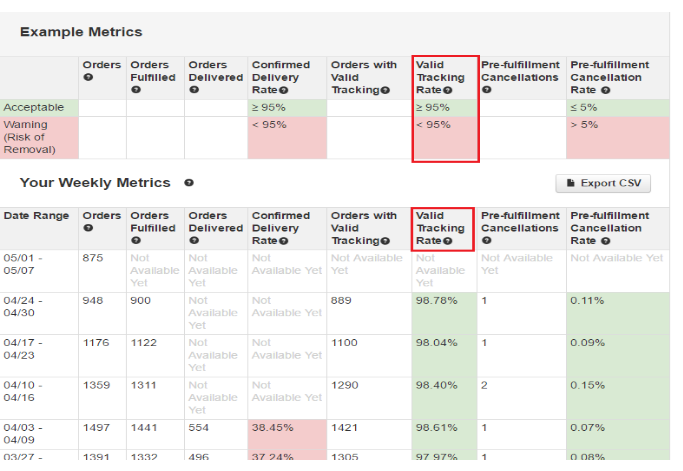 Thus, 980 orders out of 1000 orders were confirmed shipped by the carrier within 5 days from the orders being placed. The merchant’s Valid Tracking Rate is 98%. What do I do if my tracking details are incorrect? What tools and resources do I have to track this metric? In order to track your Valid Tracking Rate metric, you can follow the steps below to review performance. 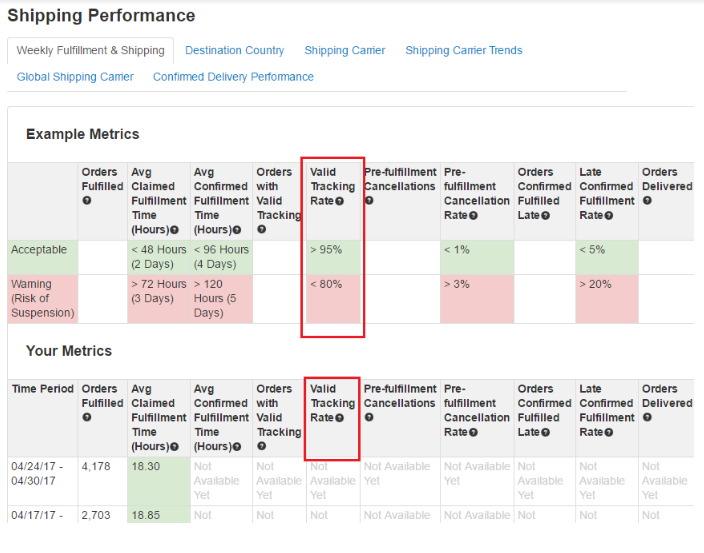 This dashboard gives detailed information on your weekly shipping performance. 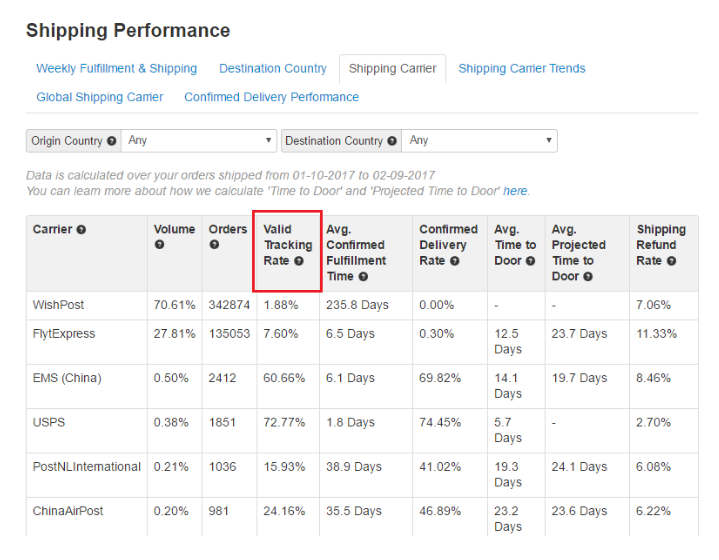 Navigate to the Performance tab and click on Shipping Performance > Weekly Fulfillment and Shipping Performance. Review your valid tracking rate on a weekly basis and always aim to be above 95%. Click on the Destination Country tab to review valid tracking rates for each country you ship to. This will give you a basic idea about which countries are responsible for your low Valid Tracking Rates. 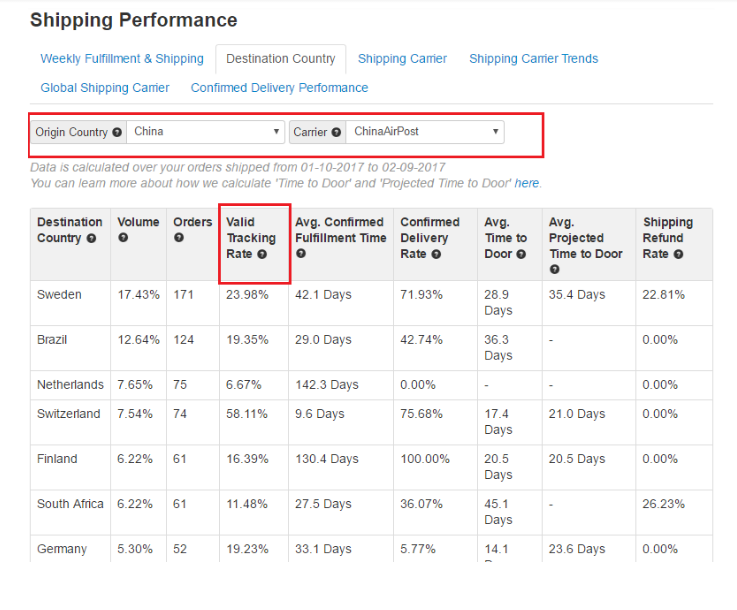 You can also filter data and review performance based on a specific origin country and/ or for a particular carrier. 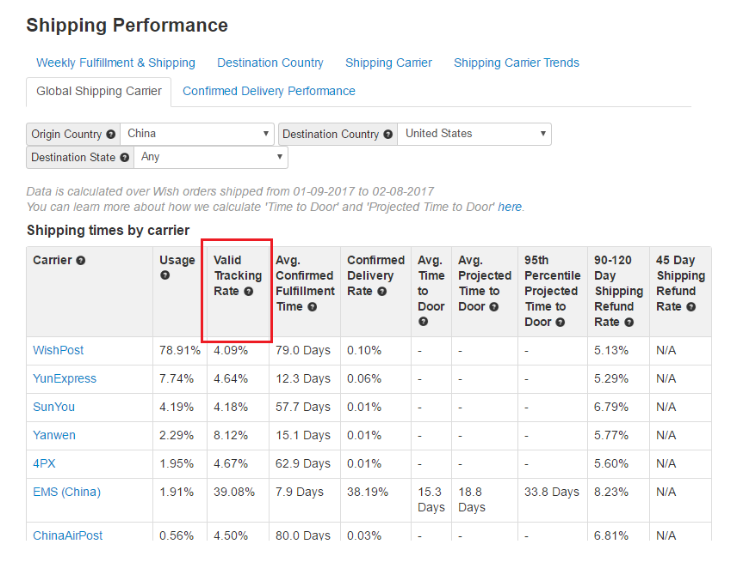 In order to review your Valid Tracking Rate for each shipping carrier and compare performance to for each destination, please click on the Shipping Carrier tab. 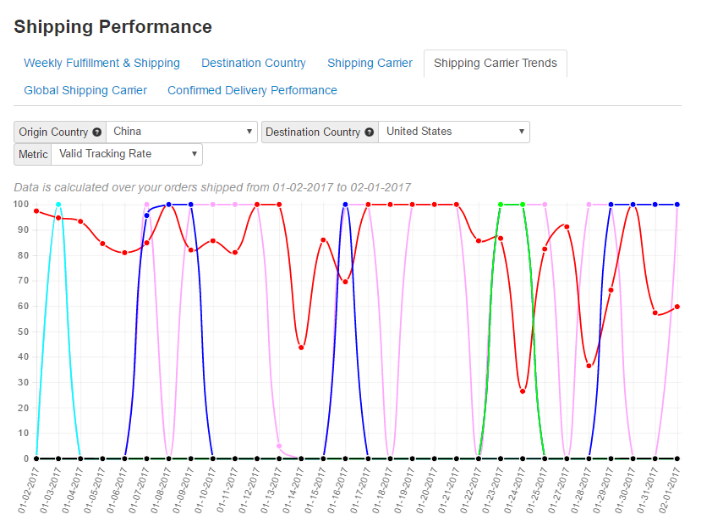 To check out the trends in your Valid Tracking Rate, switch to the Shipping carrier trends to review the trending graph. You can select your origin country, destination country and choose Valid Tracking Rate as the metric. To review Valid Tracking Rate on a global level for all carriers, you can navigate to the Global Shipping Carrier tab and select your origin country and destination country. 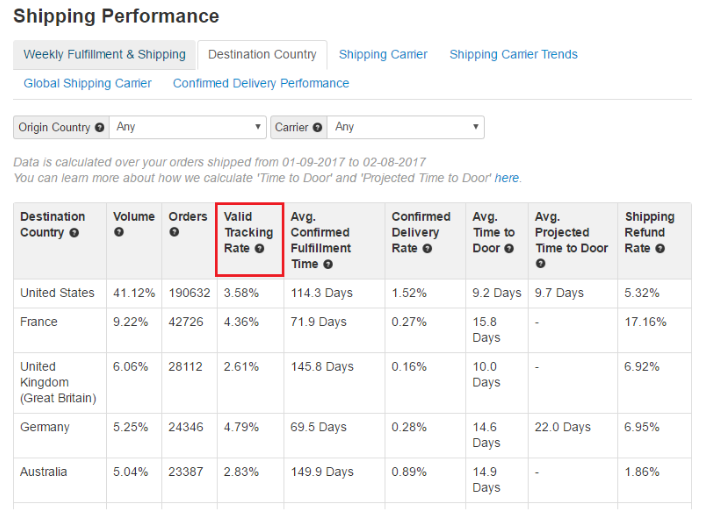 You can review your Valid Tracking Rate performance pertaining to the Confirmed Delivery Policy. To learn more about the Confirmed Delivery Policy, please click here.